I’m a big believer in small businesses. I can’t stand the Walmart’s of the world. So today, my better half and I are going to Ellicott City to celebrate the season and stores that have opened. Hope to snap some interesting shots around town. Purchase some items and help the local economy. Also hope to get some good hiking in. I need the exercise apparently. I tried to open the fridge this morning and a voice spoke from it saying I had exceeded the number of permitted openings in a 24 hour period and access is denied. I’m glad she at least left off the electric shock option. 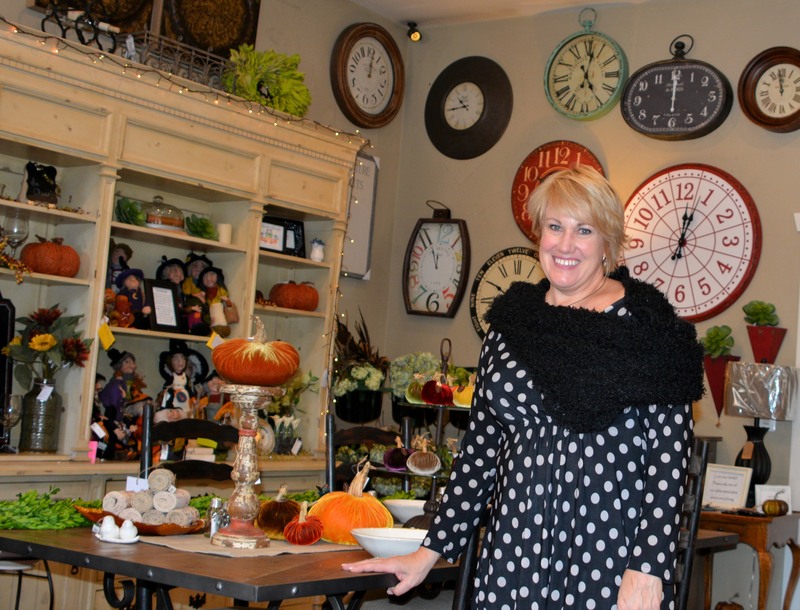 Oh and being its Small Business Saturday, it reminds me to post something about a former teacher at Waverly Woods Elementary who is now a small business owner in Sykesville at a shop called Revive and Company. My wife and I we’re visiting that town a few weeks ago and went in this store and the owner Mary Ann Vaccarino and my wife recognized each other. 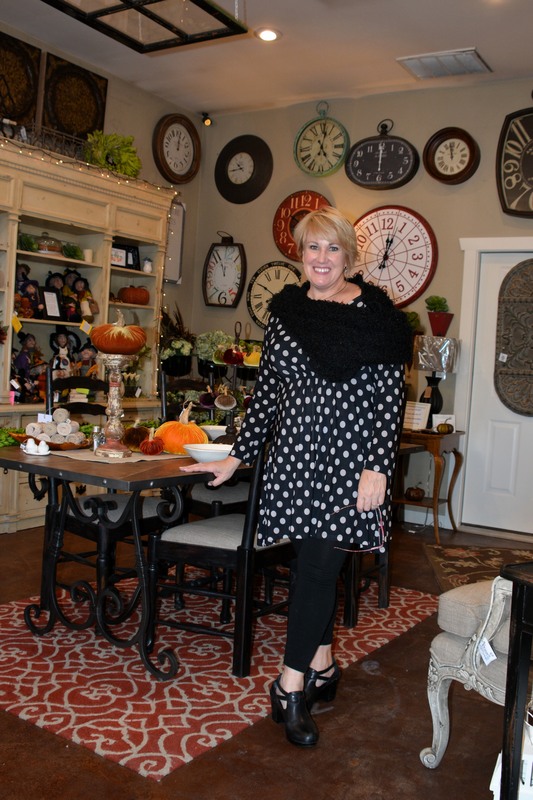 Mary Ann Vaccarino at Revive and Company. Anyway that is a wonderful store and she seemed very happy in her work. It’s right next to E.W. Becks Pub. And it’s well worth the stop if you want to make your better half happy and even maybe find a few things yourself that are cool if you have daughters to shop for. And it did have a few pieces of furniture that caught my eyes. So to help this small business along I thought today was a good day to finally post about it with a shot I took of a proud small business owner in her shop. Much luck and success to all small business owners in this coming holiday season and into 2017. It’s a monumental struggle and effort that is put in by these people. It is part of the backbone of our society. It is freedom of expression, design, invention and innovation. I was never happier professionally than when I was my own boss. Of course I was never poorer either during that time. But not every business is successful on its first try or even right away. So hats off to those that keep plugging away at it every day. Also remember that success isn’t always measured in dollars. Categories: Business, Carroll County, Life, Photography by Mike Hartley | Tags: Business, life, photography | Permalink. I have an old friend whom was once a co-worker and mentor to me as I switched work groups. You don’t find or are lucky enough to run into to many like him. For if you meet someone who freely shares valuable knowledge and insights and doesn’t use that as power but as shared growth, then you have found a special person. I know this because long after we worked together we are still together in sharing lessons of life. So I took this trip to Easton to see my old friend. A wonderful use of time because its like going to see Obe Wan Kenobi. A man of infinite wisdom and common sense. And of course with any of my friends a few laughs were shared. I’ve always tried to do this (mentoring) myself. I’ve enjoyed the last several years sharing my knowledge and watching co-workers grow quickly. But what worries me is that most work cultures don’t seem to support, reward or hold out as examples, people who are mentors. Things are so competitive now. you might have small teams that collaborate. But they even hold their cards close to their chest. It also takes a person who is confident in their own abilities and not scared of giving away tips, tricks, insights, shortcuts and all the way to high level knowledge. Because the confidence is they are always growing themselves and staying ahead of others. In other words leading by example. Being able to hold those gazillions of solutions in your head. Being able to have an intuition that is ahead of others. Being organized and meticulous in your work habits. Recognizing who to watch, learn and emulate the habits of or seeking knowledge of those ahead of you. But confidence is only half the battle. It takes a ton of time and effort and patience. You don’t get to choose who you’re working with in most cases. And in some cases its hard to continue to do it with people who don’t seem to appreciate it. But there are those who always hold what you have shared as special and a gift. And therefore a gratitude is shared. No I’m not talking monetary things. A simple thank you or smile or handshake. The acknowledgement that time and effort was taken to share. I don’t look for it or expect it but its nice when it’s received and I let them know that. I know that I’ve been doing this to some degree of success over time because I have relationships with people I have worked and shared with over many decades. I think it’s always because I’ve looked at situations like it was a team first. Its better if were all successful. And it’s usually the ones that themselves have a drive, confidence and will end up sharing with others. But along the way they remember their mentors. But again, there are more that won’t share than will. And that is kind of sad that we foster such a competitive situation internally where people use knowledge as power against co-workers. But I guess that has always been the case to some degree. All I know is that I’ve been in a role most of my life where I’ve trained and shared with many people. It is both very rewarding and very stressful or disappointing at times. But if I had it to do all over again. I wouldn’t change a thing in how I’ve worked with others. Also please don’t get me wrong here. I don’t do this because I’m told to. I don’t do it because I think it will earn me points in managements eyes. (I have a severe history of being very outspoken against management). I do it because it feels natural and the right thing to do and I’ve been around some people all my career that always shared that same work philosophy. I think this is something my closest group of friends also have in their hearts and execute in their jobs. And another reason we can share and talk about work and give each other tips and things to think about in difficult times. And while most of them have gone the management route (all still fine technicians none the less) I’ve stayed on the more technical track after a decade or two of managing. Today I have no management responsibilities. But if you’re a mentor, your always RESPONSIBLE. For not only yourself but your team. Sorry if this rambling mess of words doesn’t make sense. I’m kind of tired today. Categories: Business, Life | Tags: Business, life | Permalink. 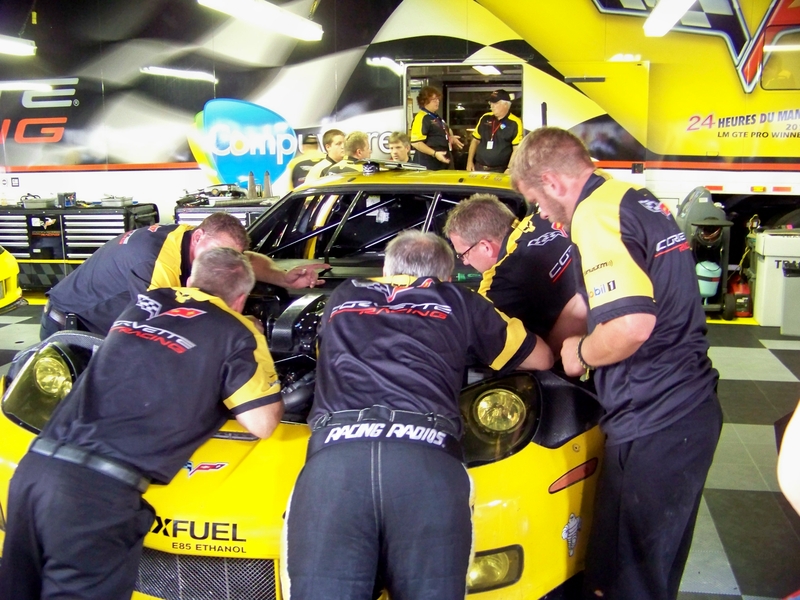 Pit crew – surgery in progress. Categories: Business, Photography by Mike Hartley, Quote of the Day | Tags: Business, photography, Quotes | Permalink. This blog was started a year ago today. As you can see it was launched and didn’t get much effort till August. From then on I’ve steadily increased my post to daily, and now multiple times a day. I’ve marveled at the wonders of others blogs. I could get lost in the images/art and writings of others. It’s like a new window to the world. And to my surprise people have discovered mine and started liking/following it. I didn’t get nearly the content or volume published, I had intended but now its rolling along each day. Yes, I’ve used a lot of previous shooting trying to build a visually pleasing blog. My hope is to really get shooting some quality images that are current. I’m working back through some of my early years shooting and some of my parents shots which are some real treasures that I hope to have up in the spring. So while I may increase the copy written it will always contain many images and videos. When I look back at my limited writing, it’s a bit embarrassing and I see I have a long way to go but I’m still encouraged enough to continue. Once I tell a few of my professional writing friends I’ve started this, they will probably cringe and grab for their hearts. For they know that the English language and me are sometimes not in sync Or is that English and I? I’ll admit it. I even failed 9th grade English and had to take it over in summer school that year to keep on pace. But hell, even if my talent is writing a witty caption on some of my photographs and that is popular or helps drive exposure of my work, then I’m happy. Hell, I’m happy if a few family and friends like it. I just have to stop writing when I’ve been up for more than 20 hours straight. I’ve learned, I’m always not going to please all the people. Then again I think I have a good sense of humor that can be entertaining at times. I’m not always politically correct, but who is? And if you show me that person, thanks, that’s one I can avoid. My wife, friends and especially my job will tell you I can be outspoken. My intention is hopefully always though to make things better. And that is part of why I started Threw Mikes Eyez. I’m trying to improve my life and those around me. I’m trying to share what my limited experiences may have taught me and some of the beauty I see in life, and maybe sometimes its ugly side. You know one of the things I worried a lot about was that my writing was pretty simple. I know the basic thoughts or quotes I might express have probably been said much better in some way a thousand times before. Well you don’t have to worry about any intentional plagiarism because about the most I’ve read in the last 4 decades have been Printing or IT manuals. When you look up “Not well read” in the dictionary my mug shot is there. I’m just starting to discover there are wonderful tools and designs available and I find my site to be very elementary so far, so I have a world to improve on that front also. Again I’m going to seek opinions and help from some of my more artistically inclined friends. And then there are some Developer types at the job that I’ve been working more with so maybe I can pick up a few tips with them. I’ve gotten back to work on my first book. For some reason I’m much more hesitant to share my words than my images. While both can have great impact, its written words that are subject to greater varieties of interpretation. I’m trying to use the quotes I write to be more positive in my life. To try to not be a selfish person and have more appreciation for what I do have. To maybe invoke a laugh or thought. But as I start to invest more time I’m going to expand the writing also, opinion, experiences maybe even a poem here and there. Which means taking more risk with the written word and lack of understanding of it. Who knows, you could be quiet unintentionally entertained. I’ve got to admit I’ve become addicted to this blogging world. I’m starting to just learn what might be possible and that is spurring so many other ideas. And ideas keep me fresh. They keep me focused on creating. They keep me happy, they keep me young. So I feel blessed to have health and time and energy to do this and hopefully allot more this coming year. It’s tough with a full-time job also, but everyone likes to eat and a roof over ones head and I aim to please. Major purchases this year include a new lens and some lighting hardware. Oh yeah, a new computer also. Don’t think I’m getting all radical with the expenses. Those 3 items might hit a grand. I haven’t made a cent yet, which doesn’t matter because hopefully I’m building the experience and portfolio of work that will turn into something that can be built on for profit in the future when either I retire or put out to pasture from my life in Newspapers. Yeah I bleed INK and always will, no matter how many electronic post I’ll make. I’m what they call a Lifer. But while the bumper sticker below hits me right in the heart, its my writing, photographing, designing and trying to remove that “amateur” word in front of all of those that gets my juices flowing these days. 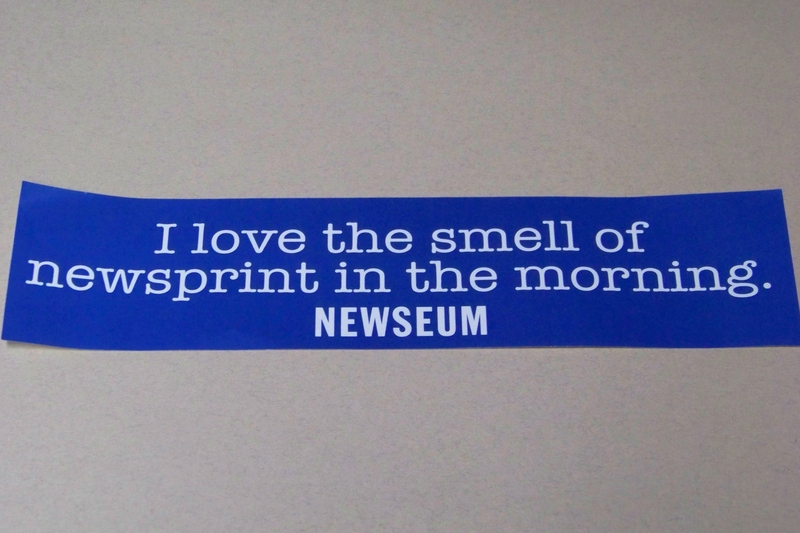 A bumper sticker I can Support. Hope this rambling mess wasn’t too confusing. I’ve been up for 22 hours and when I have to write more than the Quote of the Day, it can get messy. Categories: Business | Tags: Business | Permalink. Welcome to Threw Mikes Eyez. It’s certainly been a long time coming. Both the idea and desire to start my own company has been with me for decades. Actually this will be my second venture into a small business. The first was a partnership with some wonderful long time friends that was both a pleasure and a success. But that was just an extension of what I had been doing for a career for over 2 decades already. Starting a newspaper from scratch, while no easy task was still something we had a good base in. And 2 decades after that venture, I’m still a Newspaper Lifer at the Washington Post, with this being the first baby step towards my career after Newspapers. This is entirely different. I have no partners. It’s not a Newspaper. And I’ll expose my creative talent or lack there of for the world to see and either admire or laugh at. I don’t really care if it’s the later. For the images and video I take and share, the words I’ll string together in my books and my artwork will be first to make me happy. Second it if brings joy or thought or reflection or emotion from someone then I’ve shared something special. I hope to make enough to sustain it and keep creating. If I’m lucky enough to have profits, I’m going to take 20% and donate them to charity. Actually I’ve been working on this process a few months now. I started a blog on tumblr just to get familiar with the blog environment and in the practice of posting regularly and professionally. That small blog called My New Office which has been a history of starting to go into business on my own. I think I’ll keep that going to reflect on what it took to be successful again. Who know’s, maybe another book title. Please visit often and comment as you will. I can take it, like I said, I worked at a newspaper for over 4 decades. Then again an electronic death threat would be new. Usually they just called or left notes. But times be changing. Categories: Howard County Maryland | Tags: Business | Permalink.